The third reading deadline for substantive House bills to pass on to the Senate was Friday of this week. House members spent several hours on the House floor debating legislation covering subjects from the mundane to the complicated and even controversial. It is hard to believe that the Session has already reached this point. There are many major issues left to deal with, including the Governor’s proposed graduated income tax, the State’s budget, a slew of proposed sales tax hikes, and pending legislation pertaining to pensions, infrastructure, abortion, gun control, and legalized recreational marijuana. The Governor is also relying on skipping a pension payment of $900 million in order to make the budget balance. The Governor has admitted that his plan is currently $3.2 billion out of balance, and is advocating for more taxes and one-time gimmicks to close the gap. I strongly oppose the Governor’s progressive income tax plan for several reasons. Chief among them is the existing problem of out-migration of Illinoisans. Last year, Illinois lost 45,000 residents. The high cost of property taxes, income taxes, and the possibility of further tax hikes is the #1 factor driving people, businesses, and jobs out of our state. I LOVE Illinois, and I am committed to fixing our long-term issues…but, I cannot support any plan that further taxes businesses and people out of our State. I am voting NO on the progressive and unfair jobs tax. First up, I am proud to announce that this week I was able to advance the “Seizure Smart Schools Act” through the House with unanimous support. Sometimes in Springfield, stopping legislation from advancing can be one of the most effective tools for members in the minority party to protect Illinoisans from bad public policy. There was a specific example this week that I wanted to point out to you. I spent 20 years working as an administrator in the Illinois Department of Corrections, where I regularly interacted with bureaucrats, inmates, and corrections employees. My experience with incarcerated individuals is much different than some of the legislators that are advocating for early release for inmates. To be clear, I am a proponent of responsible and sensible criminal justice reform. I am the Republican spokesperson on the House Judiciary Criminal Law committee. I have supported efforts to reduce recidivism and overcrowding and TRUE rehabilitation for incarcerated individuals in the custody of the Illinois Department of Corrections. However, I will never support legislation that lets dangerous, violent criminals that have been sentenced to life to be released from prison. To me, this should not even be a question. This week, a bill that would have created a “Pilot Program” to release incarcerated individuals that meet certain conditions back into society was brought to the House for a vote. After Rep. Bryant rose to object to HB 2400 on the grounds that it would set murderers and other violent criminals free from jail prior to serving their sentence, the bill failed to gain enough support to move forward. One of the best parts about being a State Representative is greeting constituents and fellow Illinoisans at the Capitol during Session. The issues we face are HUGE, but I think we can all agree that we are ALL in this together. I want to urge you to come to the Capitol during Session to watch the action. You might even end up in one of these great photos or videos that we share on a weekly basis! Take a look. 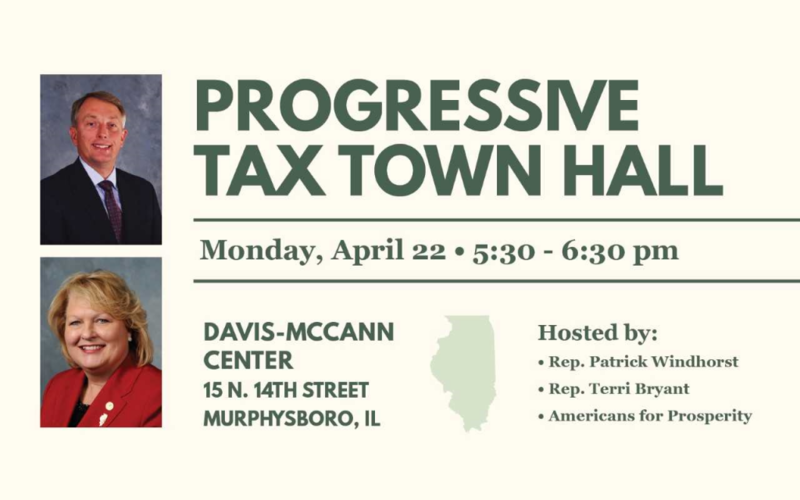 On Monday April 22, I will join Rep. Patrick Windhorst at the Davis McCann Center in Murphysboro at 5:30 p.m. for a town hall meeting to discuss the Governor’s plan to implement a progressive income tax state. Details are above. Come out and have your voice heard! There are several major issues left to be resolved in the remaining weeks ahead of the House’s scheduled May 31 adjournment. First, both chambers must deal with the Governor’s proposed constitutional Amendment to institute a progressive income tax. There is also the matter of addressing the Governor’s proposals to raise taxes on plastic bags, insurance plans, online betting, e-cigarettes, and cigarettes. Legislation to legalize/not legalize cannabis for adult recreational use.